Summit Media, the country's number one digital lifestyle publisher, held its third digital convention on August 8, at SM Aura's Samsung Hall. 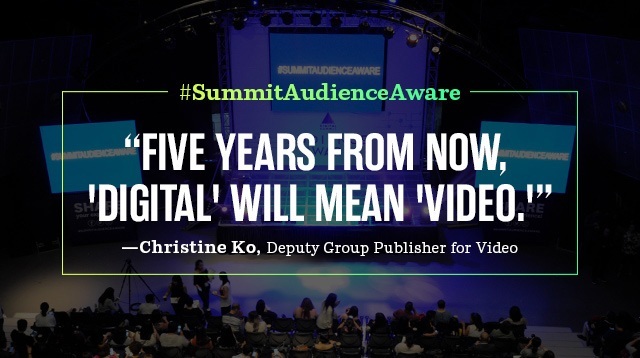 In line with this year's theme, "Audience Aware," digital experts from all over the globe discussed the reality that audience interests and preferences are changing constantly and rapidly. Brands, content creators, and advertisers need to know how to effectively tell their stories if they want to reach the right people. Amina Rillo, Summit Media's Chief Digital Officer, said, "How do you turn data into actionable insights? Listen, test, and measure." Summit does this by analyzing over 150,000 articles across its 15 channels and creating content that not only informs, but also entertains and inspires. There was also a panel discussion with clients and partners of Summit Media: Cristalle Belo-Pitt of Intelligent Skin Care, Inc. joined by Tatum Cruz and Pat Dizon of Huddle Room Media, Inc.; Raisa Ver-Bibal, head for content strategy and development, and Rovy Rivera of Globe myBusiness, a subsidiary of Globe Telecom, Inc.; and Abhishek Gupta of Mindshare World Philippines. To see more of what we learned from the conference, check the hashtag #SummitAudienceAware on Facebook, Instagram, and Twitter.